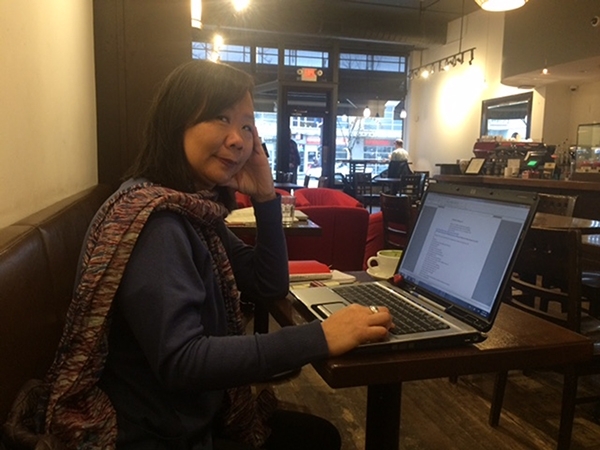 Once a week, I go to a cafe on Main and Broadway to write with my long-time friend, playwright Loretta Seto. Bean Around the World is right at the crossroads between the east and west side of Vancouver, and is easy to get to via the 99 B-Line bus. It's usually half-empty, so I can find a seat along the wall where there are electrical sockets available in case my laptop's battery is running low. The staff are friendly and the tea is looseleaf. It's not fancy or trendy, but neither am I. Sometimes I need to escape the piles of tasks and subvert my usual avoidance strategies. Loretta's focus on her plays and screenplays helps me focus, and vice-versa. Sometimes we discuss problems we're having with our respective projects. I like heading out with a clear intention--whether I fulfill my intentions is another matter. Turning off access to the internet helps. I usually bring a book or two so I can read a few poems first, and then review my notes. I might revise or edit an existing piece, or launch into a new piece. Once a month, I come here to mentor a Downtown Eastside writer, Henry Doyle, as it's easy for him to travel to. During the editing of the Love Me True anthology in 2017, I met my co-editor, Jane Silcott, here almost weekly.